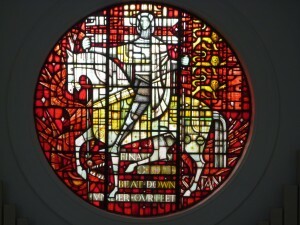 St George's Newbury » Who was St George? Home » Who was St George? St George is generally recognised as having been martyred at Lydda (also called Diospolis) in Palestine, but whether he was the same person who tore down Diocletian’s edict of persecution at Nicomedia is now questioned. The stories are very old, and many strands have become interwoven, so it is very difficult to pick out the historical from the embroidered. The earliest surviving record of him is a church inscription in Syria (at Ezr’a or Edhr’a which states that a former heathen temple had been dedicated as a church in his honour), dated about 346. The traditional account is that St George was born in Cappadocia (in Asia Minor) of noble and Christian parents. His mother appears to have been from Palestine and owned land there. On the death of his father (by some accounts his father was also a Christian martyr), he and his mother returned to Palestine. St George held a significant rank in the Roman army (perhaps a tribune or comites) during the reign of Diocletian (284-305), but when Diocletian started to persecute Christians (c303) he resigned and complained personally to the emperor. As a result he was arrested, tortured (some accounts say by being tied to a great wheel with iron studs or blades, being put into a lime pit, and being shod with iron sandals with red hot nails from all of which afflictions he was miraculously healed – in some sources he even dies each time and is saved) and finally beheaded by sword when he would not renounce his faith (on 23 April 303 or 304). The emperor’s wife Alexandria was so impressed with his courage that she converted to Christianity only to be put to death as well. The story of St George and the dragon (which first appears in the Golden Legend of 1265) is recounted as being outside Beirut near Mount Lebanon or at Silene (or Selem) in Libya. St George defeats the dragon by spearing it in the throat from his horse and then tramples under the horse’s feet, finally killing it with his sword. It is then said that many thousands of people in the city were baptised (accounts range from 15,000 to 25,000) and that a great church was later built dedicated to the Virgin Mary and St George (in which was a healing fountain). 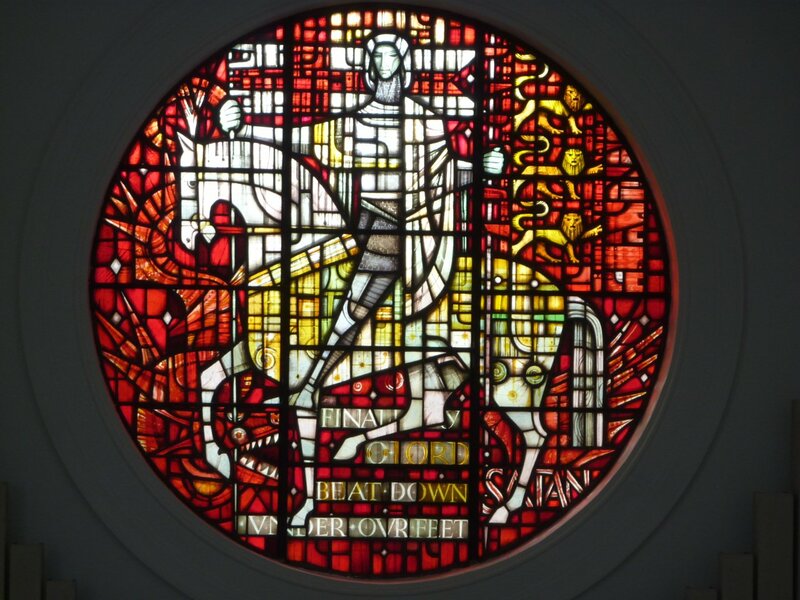 The popularity of St George seems to rise with the Crusades with him reported to have appeared during the battle of Antioch in 1098, although the first church in England to be dedicated to him was earlier than this, in Doncaster, in 1061. King Richard I (the Lionheart) of England adopted St George during the Third Crusade (1191-2) and he became the patron saint of England during the late Middle Ages. Edward III founded the Order of the Garter in 1347/8. Under his patronage, St George’s Cross (a red cross on a white background) began to be used as the English national flag in 1284, and in 1415 Henry V used him to rally his troops before the battle of Agincourt. In the 15th Century St George’s Day was as popular as Christmas and it remained an English Catholic day of obligation until 1778 (although St George was subsequently downgraded by the Roman Catholic Church in 1969 and re-elevated in 2000). He is one of the great Saints of the Eastern Church.